The Guild Players present the classic mystery thriller, set in late Victorian London. In the first floor living room of a four storey house, Bella Manningham appears to be slowly going mad, but all is not what it seems. First performed on stage in 1938, the play was twice adapted for the cinema. The 1944 American film version starred Ingrid Bergman, Charles Boyer and Joseph Cotton. Nominated for seven Academy Awards, Bergman won the Oscar for best actress. Patrick Hamilton (1904 - 1962) was a playwright and novelist. His semi autobiographical trilogy, "20,000 Streets Under the Sky", was recently dramatised for BBC television. The living room on the first floor of a four storey house in a gloomy and unfashionable quarter of London. The latter part of the nineteenth century. The action takesplace during late afternoon and evening on one day. The Archer, East Finchley's community newspaper, printed a review on page 10 of the June 2008 issue. "Some thrillers depend on that final twist, and once it's twisted there's no point in revisiting the scene. Others keep you going back for more. 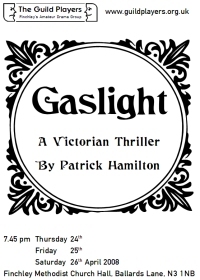 One of those others is Gaslight, which was the Guild Players' April production. I also found something new in this 70 year-old drama by Patrick Hamilton. For the moment, let's just say "Columbo". Performed countless times on the stage and filmed twice, with the 1944 film loaded with Academy Award nominations, this is the story of a young wife who appears to be going mad, her enigmatic husband and an unconventional detective. The role of the wife, which won Ingrid Bergman an Oscar in 1944, holds the play together. She is on stage virtually all the time, and the serious subtext is the terrible vulnerability of Victorian women. Mrs Manningham, played brilliantly by Rachel Kudlick, was lucky, too many women were trapped in abusive marriages or even imprisoned in asylums. What saved Mrs Manningham was the timely arrival of the detective. Or should I say Columbo? Stuart Shrank's questioning of the husband ("Do you think, sir� ?") reminded me irresistibly of Peter Falk, which just added to the evening's enjoyment. Ian Antony-Paul, as Mr Manningham, was most convincing in his bullying moments, which made it all the harder to see why his wife was apparently still half in love with him. Sally Martin and Caroline Wallace were excellent in their supporting roles of household staff, and the production was skilfully directed by Judith Shrank. The Guild Players, who welcome all members of the community, are based at Finchley Methodist Church, Ballards Lane, N3."